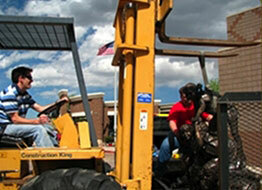 Bronze Sculpture Installation - we take EXTREME care! The mounting process varies depending on the scale of the bronze and Rocky Mountain Bronze Shop has the equipment and expertise to provide the mounting service you require. In shop we drill stone and wood bases for mounting of smaller pieces, and for larger scale installations we provide templates for site preparation as well as properly fitting the sculpture for mounting on site. In the shop we drill stone and wood bases for mounting as required, and securely attach finished sculptures to the drilled base for delivery. Bases can range from sandstone slabs to highly polished granite capped walnut. Care is taken to properly place the piece on the base and align mounting hardware for attachement. In some instances, bases are not required, and engineering management requires mounting templates for site preparation prior to delivery. We accurately produce these mounting templates to make sure the installation runs smoothly and proper fits are achieved. 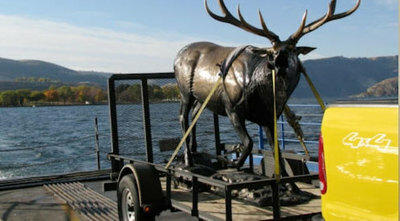 Large scale bronze requires special handling in all phases of production and we at Rocky Mountain Bronze Shop are experts in the proper handling techniques required to get heavy artwork to its installation site and securely installing it there. We take great care in strap placement and padding, ensuring that the piece and the patina arrive intact and undamaged. We offer nationwide pickup and transportation services, all overseen personally by our most experienced personnel. Transportation service can be arranged with as little as a week lead time, allowing flexibility in the sometimes hectic world of art. Transportation bids are usually generated within the business day based upon pickup and destination locations and size and weight of the pieces being delivered. 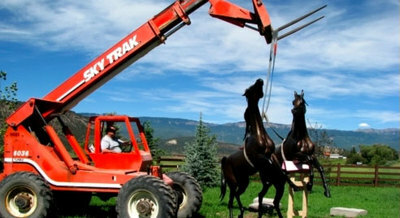 Equipment is arranges, and sculpture crating service is also available. 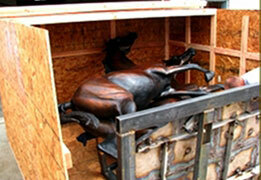 Crating service for sculpture delivery varies depending on the ultimate destination of the piece. 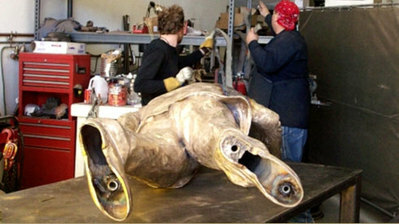 Sculpture destined for United States installation and delivery lacks the strict materials restrictions imposed by international shipping, and is therefore less costly. When crating for international shipments, we ensure that crating materials are appropriate and we coordinate with shipping reps to meet pickup deadlines and get the artwork to port in a timely fashion. Coordination is key for successful site preparation and secure sculpture installation. Each installation has its own purpose, some installations are for temporary or seasonal use, some are permanent sculptural installations, and others are designed with the capacity for rotation. 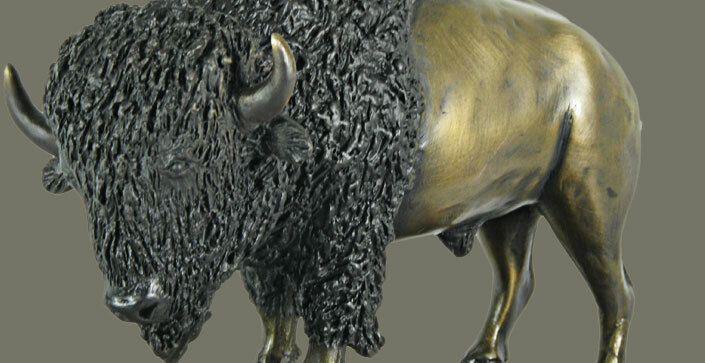 Rocky Mountain Bronze Shop is aware of this, and takes these factors into account when preparing bronze sculpture for installation and prepares for them in advance. We coordinate with architects regarding site preparation, and with equipment providers to assure that the proper heavy machinery is available on site at the time of installation. We take extreme care in unloading and maneuvering each bronze into position, and properly secure it, whether for permanent installation using stainless steel rods epoxied into custom drilled holes, or using temporary bases bolted onto multiple use concrete pads. In any instance, rest assured that each artwork is handled with the utmost caution and that the new owner will be absolutely pleased with its condition.